We look at some of the festive-themed school trips ideas that are fun, educational and, of course, full of Christmas cheer. The year may be drawing to a close for the holidays but there’s no reason why you can’t plan a Christmas inspired day outside of the classroom during your final few weeks of term. What better way to get in the festive spirit and immerse your students in the culture of another area, than with a visit to a Christmas market? A trip to the markets in Lille, France will give your students the opportunity to put their French language skills in practice, while visits to Cologne will have them working on their German. The UK is also home to a number of Christmas markets, including the famous Winter Wonderland in Hyde Park, London. Alternatively, Manchester, Birmingham or Edinburgh also all run popular markets. Plus, a day out in these historic cities can offer plenty of educational benefits with the opportunity to explore museums, gain an insight into the cultural history and explore attractions in a new area. There are plenty of ice rinks that run year-round but they’re still a great option for those looking to book a Christmas-themed trip – plus they’re brilliant for encouraging an active, creative and team-building environment. Planet Ice offers a range of day-time sessions across the country in destinations such as Milton Keynes, Peterborough and Basingstoke, among others. The National Ice Centre in Nottingham runs a six-week school skating programme, which upon completion every child receives a certificate of achievement. Meanwhile, London’s Somerset House has a temporary ice rink in place from 14th November until 13th January and Yorkshire’s Winter Wonderland is offering special school packages on its ice rink from 17th November to 6th January. Taking your students on an illuminated trail through some of the grounds and gardens of a historic home can make for a unique trip outside of the classroom. Blenheim Palace has announced that its Illuminated Christmas Lights Trail, running from 23rd November through until 1st January, will be brighter than ever. Alternatively, throughout the year Blenheim Palace runs educational tours offering an insight into the history and living legacy of the site. Meanwhile, once the animals have gone to bed, ZSL London Zoo will come alive with a festive sights and sounds (22nd November – 1st January). 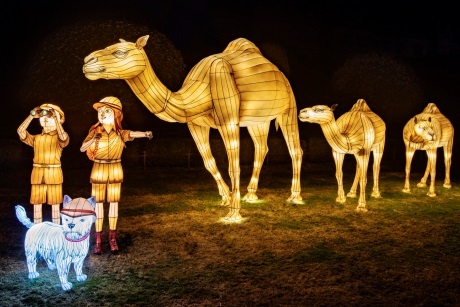 Similarly, students will find themselves wowed with wondrous scenes as they take part in an expedition around the world as part of Longleat’s Festival of Light (10th November – 6th January). Both ZSL London Zoo and Longleat offer the opportunity for students to learn about and get close to a whole range of animals across the course of the year. What would Christmas be without the magical reindeer? Take your students on a unique Christmas trip to meet the stars of the show. Blithbury Reindeer Lodge in Staffordshire offers tours with experienced animal handlers, or you could encourage your pupils to interact with the reindeer and a variety of other farm animals at the Reindeer Park in Sutton Coldfield. As time goes on, more productions are running workshops and offering educational resources for visiting schools – making a trip to the theatre both fun and beneficial. School groups can get into the festive spirit as they follow the story of a Primary school’s attempt to put together a Christmas production in Nativity! The Musical, in London from 19th-31st December. Or, watch on as one boy attempts to save Christmas in Horrible Christmas, by the Horrible Histories team, at Alexandra Palace from 13th-30th December. Other shows not to miss include a pantomime of Aladdin (Hackney Empire, 24th November-6th January), and Matilda The Musical (currently touring the UK) both of which can be further enhanced with their educational offerings. With April being National Garden Month, we’ve looked at some of the best gardens in the UK for school trips, focussing on inspiration for pupils away from the classroom. Immerse your pupils in fascinating history with these experiences for schools. With the UK boasting plenty of theme parks and attractions, schools are spoilt for choice when it comes to finding a thrilling educational school trip.